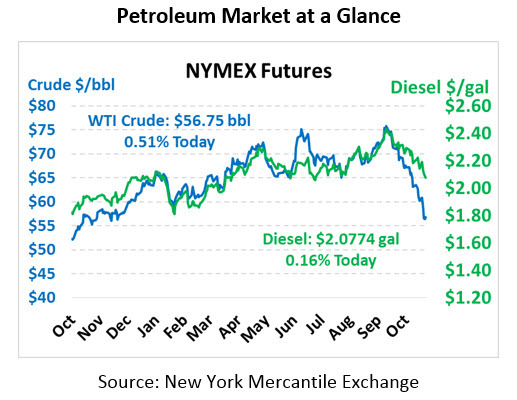 This morning saw fuel prices stage an early rally, but selling pressure has cause the commodity to fall back to flat. This afternoon, crude oil is trading at $56.75, up 29 cents from yesterday’s close. Fuel prices are also trading higher. Diesel prices are $2.0774, up 0.3 cents since yesterday. Gas prices are $1.5777, gaining 2.1 cents. The EIA release their weekly data yesterday, a day delayed due to Veterans Day, and the results were mixed. Crude saw even larger builds than the API reported, showing a large excess of supplies in the US. 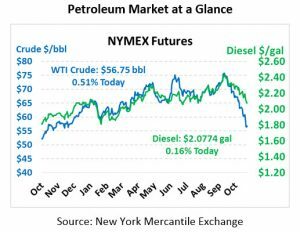 Conversely, gasoline draws were in line with market expectations and more bullish than the API’s data suggested. Overall, the markets were happy to see product stocks falling, and prices managed to eke out small gains. OPEC continues to spur the market, with the group considering a 1.4 million barrel per day cut in 2019. Some analysts are now relating Saudi Arabia’s policy change (shifting from pumping at full rate before the midterms to threatening a cut) to the US’s Iran sanction waivers to eight countries. Some sources have noted that Saudis no longer trust Trump after he cajoled them into increasing output before the midterms, only to grant waivers to several countries causing oil prices to fall even further. Russia is sticking to their claims that markets seem balanced and reduced output is unnecessary.